Choose the leaves loaded with gel. These are mainly at the center of the aloe vera plant. Use a sharp tool to cut them carefully at an angle from the plant’s base. Drain the yellow sap by standing the leaves upright for about 15 minutes. Wash the leaves after they have been completely drained. Carefully cut off the green layer and divide the transparent gel into various cubes. You can also cut the leaves well into two halves from the bottom top and remove the gel using a spoon. Note: You can buy aloe vera gel from market or stores if you don't have aloe vera plant. Put all the ingredients (except vitamin E) listed above in one container. Add vitamin E capsule to the mixture. Apply the resulting paste to your face and neck. Leave the mask for about 20-30 minutes. Rinse the application using warm water. Peel off the cucumber and remove the seeds. Slice the cucumber into small pieces. Place the aloe vera and cucumber slices in a blender and squash them to a smooth paste. Using your fingertips, carefully spread the paste on your face and neck. Wait for 30 minutes after application. Wash off the application with relatively cold water. Dry your skin using a clean towel for a hydrated, soft and supple skin. Mix 1 tablespoon of turmeric with 1 tablespoon of the turmeric. Add the two tablespoons of aloe vera gel to the paste. Apply the paste on your arms, neck and face. Leave the application for about 20 minutes. Wash off the application with water. Repeat the procedure twice a week for efficient pigment and scar removal. Mix 1 tablespoon of honey with 1 tablespoon of milk. Add a nip of turmeric and rose water drops too. Apply paste on the neck and face. Wash off with warm water after 20 minutes. Mix 1 tablespoon of honey with 2 tablespoons of yoghurt. Add 2 tablespoons of aloe vera gel to the mixture and stir well. Add red grape juice and mix for a smooth paste. Apply the paste on the neck and face. Rinse off with water after about 30 minutes for better anti-aging results. Place 2 pieces of cucumber in a blender. Squash them to a smooth paste. Pour out the paste into a bowl. Add 2 tablespoons of aloe vera and 2 tablespoons of oatmeal. Carefully, whisk 1 egg white into the paste and make it even. Apply the paste on a clean neck and face. Rinse off with cold water after 20 minutes. Mask the papaya piece sufficiently to cover your neck and face. Add 2 tablespoons of aloe vera gel in the papaya mixture. Add 1 tablespoon of honey to the paste. Mix thoroughly to get a uniform mixture. Apply it on your neck and face. Wash off the application after about 30 minutes. This paste is very useful for detoxifying your skin while freshening it. Cut the mango fruit in small sizes. Put the mango portions in a blender and squash them. Add aloe vera gel extract and mix thoroughly. Add lime juice to the paste and stir well to mix evenly. Rinse the application with cold water. The use of aloe vera face mask should be discontinued immediately in the event of an irritation or some redness. The application should be washed off at once. For the best results, always wash the areas to be applied e.g. face, neck and your hands too. Do not use leftovers of your face mask for later application. It is prudent to reduce the recipe in future. 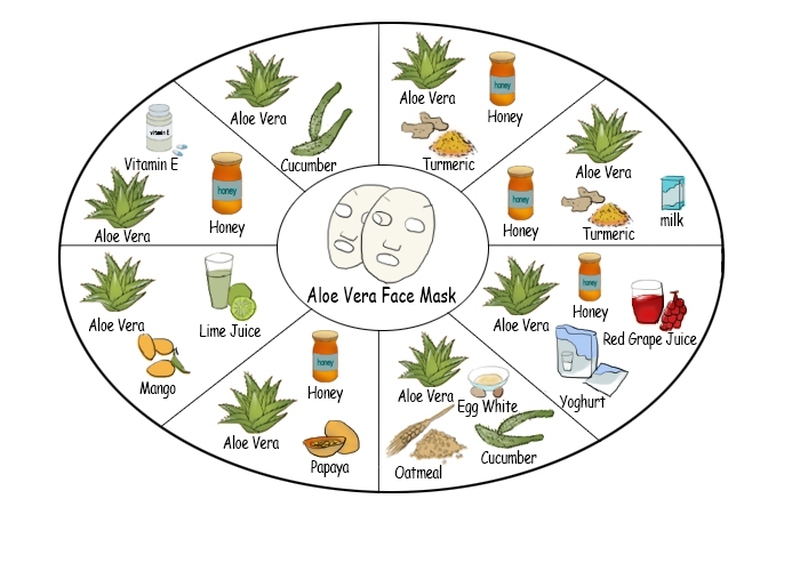 While applying your aloe vera mask onto the face, avoid any contact with the eyes and the regions around them.